Just as HiYa and Kung Pao were getting ready to karate chop each other……along comes trouble. And HiYa and Kung Pao manage to chase off the devils with a series of karate chops. As for the cowducks….Buck Cowduck got his red cowboy hat back and they flew the stoop. And HiYa and Kung Pao continued to argue over who is the sensei. Kun Pao: “I am sensei!”…..
With temperatures almost reaching 60 degrees today, Cheese Duck decided to go for a nice waddle in the city. 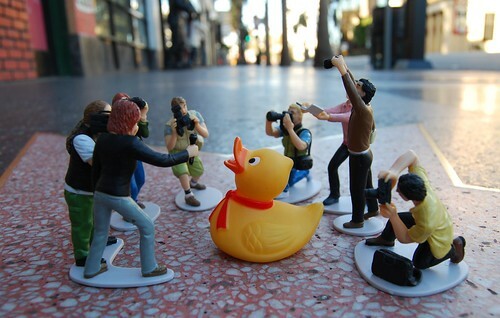 Unfortunately a group of prankster devils decided to follow Cheese and play some April Fool’s Day jokes on the clueless duck. Little did the Devils know, Cheese was not such an easy target. Looks like the joke was on them. Cheese Duck had “cut the cheese” and they were downwind.